Organizations are looking for ways to get more out of their already strained IT infrastructure as they face new technological and economic pressures. They are also trying to satisfy a broad set of users (internal and external to the enterprise) who demand improvements in their quality of service (QoS), regardless of increases in the number of users and applications. Cloud computing offers attractive opportunities to reduce costs, accelerate development, and increase the flexibility of the IT infrastructure, applications, and services. Infrastructure as a service (IaaS) is the typical starting point for most organizations when moving to a cloud-computing environment. IaaS can be used for the delivery of resources such as compute, storage, and network services through a self-service portal. With IaaS, IT services are delivered as a subscription service, eliminating up-front costs and driving down ongoing support costs. Businesses can improve their competitive position by moving to these cloud-based technologies. 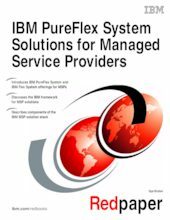 This IBM® Redpaper™ discusses IBM solutions for managed service providers (MSPs). This paper is for IT professionals who are involved in managed and cloud services solution planning.